PTSD Combat is no longer being updated. Find Ilona blogging at Magyar Etimológia and Etymartist. Since it's been mostly quiet here the past year, it's time for me to write a note. First come the thank yous. To those of you who have read, shared and/or supported my Moving a Nation to Care project, you are appreciated. The slim volume made bigger waves than this little fish ever expected. To all of you who, at one time or another over the past five years, visited PTSD Combat -- and most especially to its nearly 1,300 subscribers, who supported my writing with your vote of confidence -- thank you for sharing the journey. For all the veterans and military family members and veterans advocates I have interacted with, or humbly was able to help in some small way, or even sadly could not help due to my own time and resource limitations, my deepest gratitude for all you do for our nation. Thank you for letting me be a part of your life. It's been five remarkable, unimaginably productive and ever-to-be-cherished years of veterans advocacy work. What eventually became Moving a Nation to Care, was first an issue that I simply stumbled into unwittingly back in 2005. First, as a citizen journalist, and later as a recognized expert, my attempt to understand why some of our veterans were returning home from war only to commit suicide landed me on avenues I'd never plotted for myself. Life has a funny way of pointing you in the direction you're most needed to go, it seems. I tried to do my best and rise to the occasion. When an opportunity to push the issue of combat PTSD presented itself, with the blessing and backing of my husband and family, I did what I could to raise Americans' awareness. Many of the same seasoned advocates who welcomed and helped this unknown novice writer continue the work still today. I could list all of you; but, there are too many to count. You know who you are. Thank you for doing what you do. The work is unrelenting, exigent, and often thankless. I know. And I say, "Thank you." I have been honored to have been a small grain of sand in this movement to raise awareness and exact change concerning issues of so much importance to our troops, veterans, military families and even citizens. But everyone needs to regenerate and refresh themselves every-so-often, and that is certainly the case here. Sadly, PTSD Combat is officially being retired today. I've been grappling with this for quite some time. After taking a long-needed break from blogging in 2010, and contemplating where the road will now lead for me, I'm excited to begin a new journey. It's not entirely a departure from what I've been reporting on over here -- it's more a broadening of focus, actually. You're invited to join me, of course. I also will keep a toe dipped in the water, so-to-speak. My husband and I will continue to support veterans organizations through our private donations and efforts. And, I'll be running to raise money for military families in need this year and -- legs permitting -- beyond. If you'd like to follow my small steps in supporting our troops, as well as learn more about general stress and improving fitness, please see my new blog, Stressing Fitness (or twitter or facebook). Current subscribers, you're invited to sign up anew. I've also been chosen to be a member of dailymile Team 2011. As an ambassador for this vibrant social training log community, I'll be blogging and well as logging my own stress-busting workouts. Sign up at dailymile to join me in better health. Thank you so much for allowing me to have a voice on an issue that I continue to care so much about. I also look to the stars and send a thank you to my late sister, Zsuzsanna, whom we lost to suicide 10 years ago. Through that pain, I gained a deep empathy for other families going through the same tragedy. We have much to offer one another in the world. Above all, I hope that we continue to work to remove the stigma of imperfection that defines the human experience. We are all just trying to make our way, doing the best that we can in an imperfect world. Tragedy and challenge define our reality. But we need not be defined by it. Marcel Proust said, "We are healed of a suffering only by experiencing it in full." My work here helped me, too. Let's continue to strive and work together so that we may all attain strength in body, peace of mind, and nourishment of spirit. The load is much lighter, the road much brighter, together. While a wide variety of events can trigger what's called post-traumatic stress disorder, this PTSD blog focuses solely on the combat-related variety. 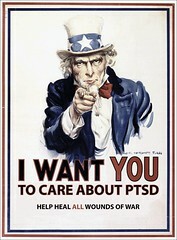 As a new generation of warriors returns to civilian life and seeks out resources, PTSD Combat is here to help. This is the online journal of Ilona Meagher, veteran's daughter and author of Moving a Nation to Care: Post-Traumatic Stress Disorder and America's Returning Troops. You are invited to read my bio and stay connected via the networks to the right. In a hurry? Use the top left Blogger Search Bar. In trouble? Helplines 1-877-VET2VET, 1-888-777-4443, 1-800-273-TALK (8255). Combat Stress/PTSD: What are the Symptoms? Ilona's events are listed in green and also found here. March 4, 2010 in DeKalb, IL - Northern Illinois University Veterans Club hosts its first-ever community Military Benefits/ Informational Fair, 12:00 to 4:30 p.m. Ilona is slated to be the guest speaker. Spring, 2010 in Bethesda, MD - Uniformed Services University 5th Annual Amygdala, Stress and PTSD Conference, details TBA. July 10-15, 2010 in Honolulu, HI - International Conference on Alzheimer's Disease (ICAD). The information presented on this web site is based on news reports, medical and government documents, and personal analysis. It does NOT represent therapeutic prescription or recommendation. For specific advice and information, consult your health care provider. Comments at PTSD Combat do not necessarily represent the editor's views. Illegal or inappropriate material will be removed when brought to our attention. The existence of such does not reflect an endorsement. This site contains at times large portions of copyrighted material not specifically authorized by the copyright owner. This material is used for educational purposes, to forward understanding of issues that concern veterans and military families. In accordance with U.S. Copyright Law Title 17 U.S.C. Section 107, the material on this site is distributed without profit. More information.